There’s no gun like the Sig P250. Really! I reckon you’ve seen a lot of 9mm pistols in your years, but this one clearly is one-of-a-kind. Welcome to the GunRights Sig P250 Review. I’m here to gather all the info you’ll ever want or need about the Sig Sauer P250. A gun so versatile deserves a proper rundown of its specs, uses, and other technical aspects, so let’s get to it! The German design and make really show in this truly underrated pistol. The fact is that it’s hard to change the buyer’s choice when buying guns. Most will be more than satisfied with acquiring a Glock and be done with it. However, true gun enthusiasts will know the advantage a bit of research poses. Sure the Glock may be already an established brand. It’s clear that these pistols are no joke and that they will be around for some time. Yet, I reckon this Sig Sauer P250 review will make you at least glance over what this amazing gun can do! The Sig P250-22. The basic Sig P250-22 is a slightly altered version of the basic one. Instead of a 9mm caliber, this one goes best with the .22LR, as the name says it. Like all the others, it’s wholly interchangeable. Because of its low price, this gun with a single magazine, so if you want a replacement one, you’ll have to make a purchase separately. The reduced size and weight make it perfect for concealed carry. The Sig P250 Compact. The compact version of the basic, full version Sig P250 comes equipped with all the nice features of the original one. Even the prices are the same. The trigger pull is equal and the only difference comes in the fact that this one can’t fire .357 SIG rounds. The compact Sig Sauer P250 is okay for concealed carry, but the Subcompact and the 22 may prove better at that. The Sig P250 Subcompact. The subcompact is a dumbed down version of the compact P250. However, when it comes to performance, it does just as well. It weighs somewhere in between a Compact and a P250-22, yet closer to the former. This is slightly better for concealed carry than the basic Compact. Want a great concealed carry gun? 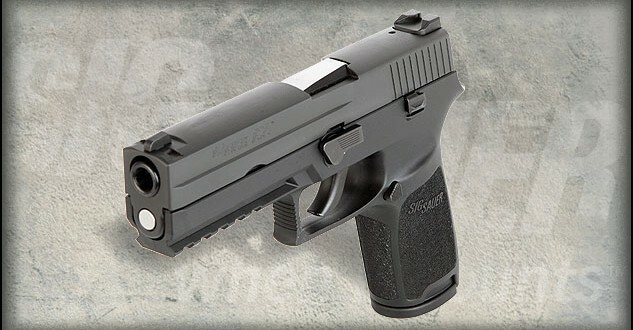 Why not try the Sig P250-22 for just $434!? The Sig P250 Compact Threaded Barrel. Are you a fan of threaded barrels? If so, this one’s the Sig for you. However, it does come with one big disadvantage: it’s just a 9mm gun. You can’t shoot the famous .357 SIG, or the .40 S&W, or even the .45ACP. Still, if you’re okay with that, the decent, fixed trigger pull of this gun could make it ideal. Still, this one is appropriately expensive. The Sig P250 Full Size. The classic Sig Sauer P250 is a beautiful gun. It’s sturdy and bulky, it fits well in any holster, and its nice finish makes it stand out. A perfect gun for law enforcement, military, and even for home defense, the P250 is serious and will shoot accordingly. It’s also the heaviest of the lot, but for its weight, it comes with a lot of reliability. You simply can’t go wrong by choosing the full-size model, complete with the night sights and the extra mag. 25.1 oz. / 26.9 oz. Remove the magazine and unload the gun. Make sure there’s no bullet in the gun. This is paramount. You don’t want to hurt yourself while changing the caliber of the P250. Remove the slide. Press down on the lever and pull the slide in the opposite direction. It should come right off. Remove the takedown lever. This will allow you to remove all the other part. Remove the rail. Pull up on the frame while rotating the hammer down. This may prove a bit difficult if the gun has been used for a long time in this configuration. Put a bit of force and it should come right off. Reinsert the modular frame. Choose another frame assembly and simply insert the modular frame into it, rear-end first to make sure the tab is locked into the inside of the grip module. Reinsert the takedown lever. Find the hole on the side of the gun and reinsert the lever into it. Reinsert the slide. Push it down fully while rotating the lever into the slide position. Reinsert the magazine. The last step is to put the mag back. There you have it! 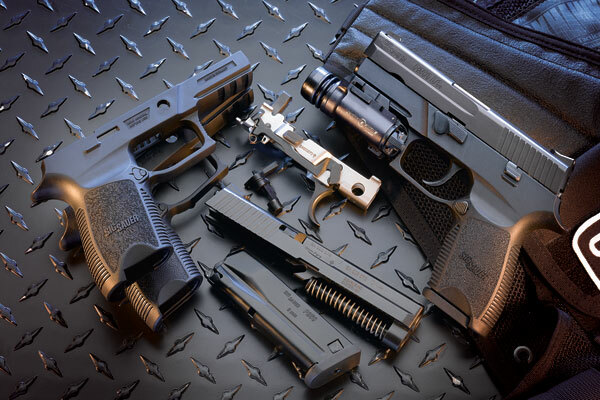 You’ve successfully changed your Sig P250’s size, caliber, and weight! What are your thoughts on the Sig P250? Did you like this Sig P250 review? Let me know how I could make it better! If you have any fond memories regarding your Sig Sauer handgun, we’d be thrilled to have you share them in the comments, so please feel free to do so. Hey Buddy!, I found this information for you: "Sig P250 Review & How to Reconfigure". Here is the website link: https://thegunrights.com/sig-p250-review/. Thank you.